Located just 20 minutes from the Pillo Hotel Ashbourne, Rathbeggan Lakes near Dunshaughlin is one of Meath’s most popular family parks, perfect for a fun filled day out during your stay. With activities focussed for mainly under tens, visitors to the park are also welcome to bring a picnic or barbeque and to enjoy a day in the countryside with lots to see and do! Why not try the prizewinning Family Adventure Trail which brings you right around the park, where as you walk, you can play, learn and imagine along the way! In the par, there are additional paid activities on offer, which are all based on a menu system allowing families to budget their day on their visit to the park. Starting at the entrance of the heritage park, often referred to as the “lungs” of the park, this is a beautiful and special part of the park. In the water zone located on the lakes, experience fun for all the family with Swan paddle boats, Water Rollers and an Obstacle Course! Enjoy beautiful sounds and sights along the walkway and don’t forget to keep an eye out for the resident ducks on your visit. Get your adrenalin pumping and challenge yourself with the High Kings Tower Zone. 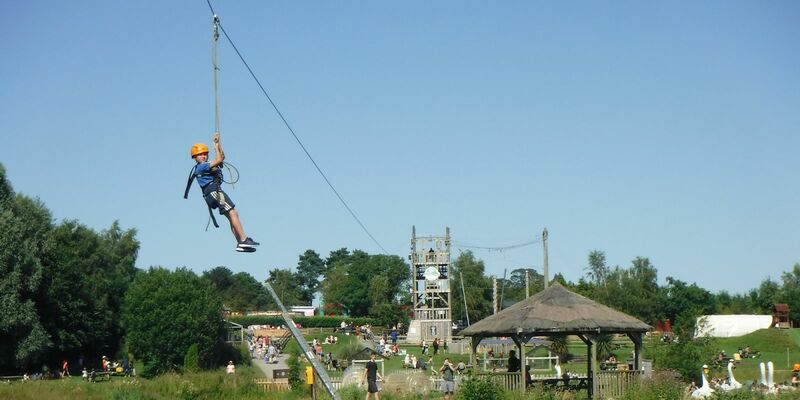 Perfect for slightly older children from 6-7 years and older, experience activities such as the Zip Line across the lakes, The Climbing Wall and The Leap Of Faith. Which one will you dare to try? With a range of bouncy castles, slides and a maze to explore, children will have hours of fun in this zone. If you are bringing a picnic, the area also has picnic tables to enjoy a well-deserved lunch after an exciting day at Rathbeggan Lakes.